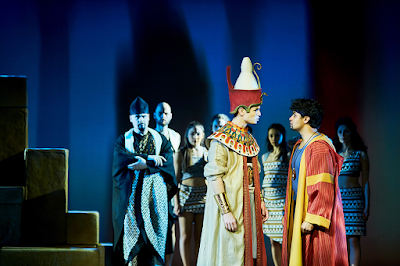 Please note: Fredericia Teater invited me to see their production of The Prince of Egypt for free. I would have wanted to love this musical. Dreamworks' 1998 animated movie The Prince of Egypt is one of my top favourite animations, even top favourite movies, of all time. It retells the Biblical story of Moses, combining intense music with beautiful visuals to such an effect I cannot watch it without crying. So, hearing the world premiere of a musical based on the movie was going to take place in Fredericia Teater, Denmark (the very same theatre that brought us that amazing production of Disney's The Hunchback of Notre Dame), as an American/Danish co-production – well, you try not getting excited. I attended the opening night last Friday. I would have loved to like it, but I have to be honest. It was a complete mess. The story of the Dreamworks picture (directed by Brenda Chapman, Steve Hickner and Simon Wells, screenplay by Philip LaZebnik and Nicholas Meyer, songs by Stephen Schwartz and score by Hans Zimmer) is based on the Book of Exodus and can be summarised in a couple of short sentences: Moses and Ramses are brothers. God gives Moses a difficult task. The brothers turn into enemies. The movie starts off with the following disclaimer: While artistic and historical license has been taken, we believe this film is true to the essence, values and integrity of a story that is a cornerstone of faith for millions of people worldwide. 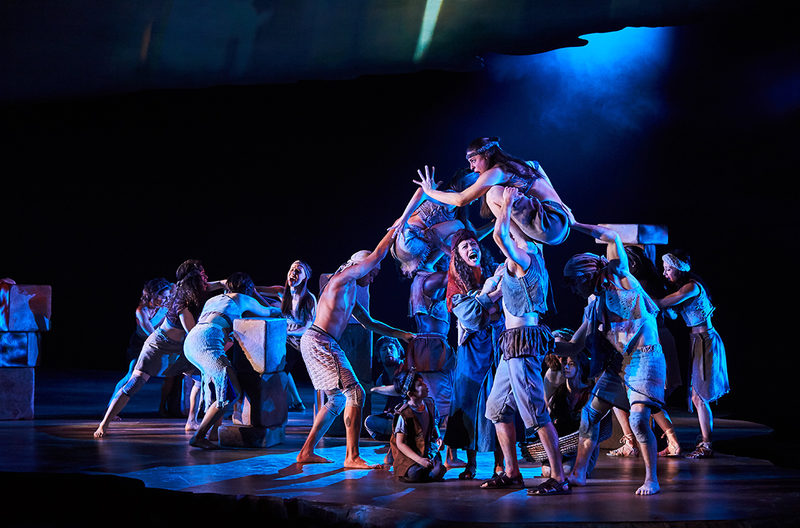 The new musical is written LaZebnik too, but instead of respectfully expanding upon the movie while keeping in mind the story's Abrahamic origins, it serves us an unfocused, childish jumble of new characters, scenes, and motivations. The subtlety, beauty and indeed integrity of the original film is thrown out of the window. Instead, we get less-than-memorable new tunes from Schwartz, cringeworthy jokes and an ending so naïve and sappy it puts all Disney fairytales to shame. The first act is not without its problems, but, in the grand scheme of things, it's quite serviceable. You have baby Moses in the basket on the river, Moses and Ramses growing up together, their father the Pharaoh raising his boys with an iron fist and insisting that crown prince Ramses shall not be the weak link to break the chain of their mighty dynasty. You have Moses killing a guard, running away to the desert and meeting his destiny. It's not perfect but leaves you curious for the second act – which is where all hope is lost. Where shall I start? Should I first tell you about the comic relief-y song about slavery, or maybe the evil high priest who keeps pressuring Ramses into making bad decisions? Or about Moses's first miracle being, instead of his staff turning into a snake, him stumbling into the Nile and accidentally turning the water into blood? Or how, in the end, Moses and Ramses make amends and the force ghost of their father the Pharaoh comes back to bless their brotherly union? I am serious with this. Some more details before delving into further analysis. Tzipporah tells Moses and Ramses she is not going to dance for them, while sexily dancing. Moses doesn't help Tzipporah escape, he barely lets her out of her chains so she can dance better. Moses only stops the guard beating the slaves when he starts hitting his sister Miriam too. Moses and Tzipporah flirt while watching sheep mating. Ramses and Moses make sexist jokes about their wives. Moses visits his ailing adoptive mother, who scolds him about sending the plagues upon Egypt. The burning bush scene lasts for about 30 seconds. The ghost of the Pharaoh teaches Moses that sometimes you just have to kill a bunch of babies to make things work. Besides the complete lack of focus, the musical has a really vague, disappointing relationship with God, morality and the supernatural. No matter whether you're a believer or not, if you're adapting the story of Moses, you have to accept that God is going to be one of your major characters. Or so you would think. Here, blink and you miss the burning bush – it doesn't get its own scene, it's seriously a sidetrack in the first act finale – and even the miracles Moses performs are glanced over. All the moral lessons are heavy-handed, and instead of Ramses making his own bad decisions, a moustache-twirling high priest keeps pulling the strings and promptly gets killed off for his evil deeds. I understand turning a 90-minute-movie into a musical requires changing things and adding new material, but for the life of me, I cannot understand why all subtlety, respect and trust in the audience's capability to think for themselves has to be lost in the process. 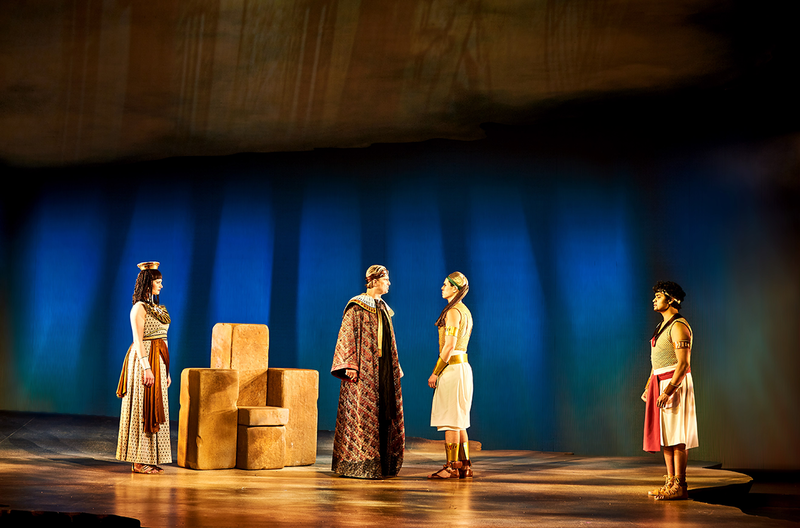 In the musical, they would have had a fantastic chance of exploring things like Ramses coming to terms with his own mortality (all his life, he's been told he's a living god, but then his brother lines up with a deity more powerful than him) or, say, the relationship in between Moses and his biological siblings. But what do we get? Force ghost Pharaoh and the power of love, that's what. 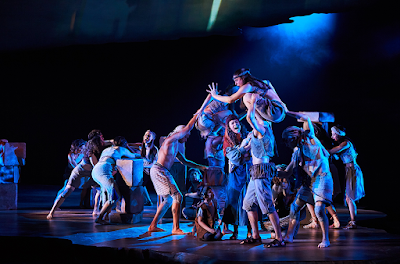 Fredericia Teater's production, directed by Scott Schwartz, has its bright moments – above all else, Sean Cheesman's innovative, beautiful choreography and the vocals of leading man Diluckshan Jeyaratnam. Cheesman's choreography and the talented dancers are the true stars of the show, I only wish there was even more space for dance. The dancers form the river, the horses and chariots, the desert sand, the burning bush... There are also some more traditional but nevertheless impressive dance breaks. Through Heaven's Eyes is absolutely wild. 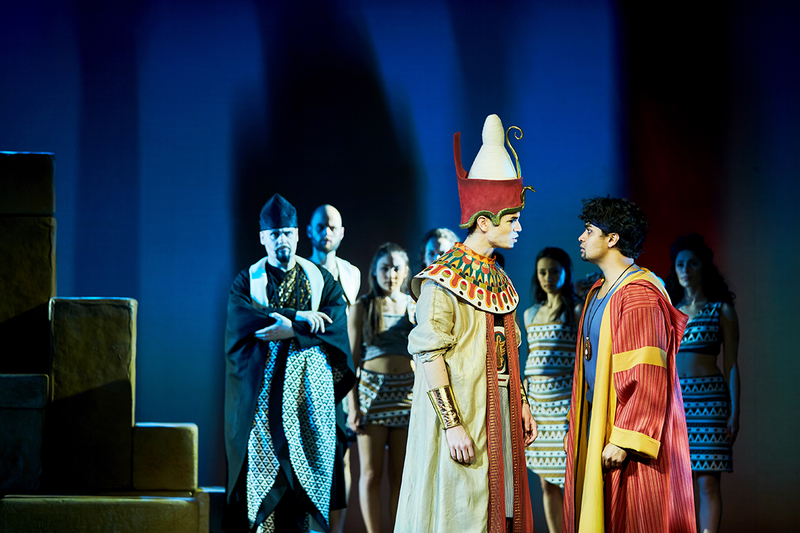 When it comes to the actors' performances, besides admiring Jeyaratnam's vocal chops, I was entertained by Mads M. Nielsen's performance as Pharaoh Seti. He chews the scenery, shouts and yells and looms around, it's all rather hammy and very amusing. For the most part, though, the performances felt rather one-note to me. Maybe that's because the characters are written as such, or maybe I'm just not the biggest fan of Scott Schwartz's style of directing, seeing I wasn't too hot on his Hunchback, either. The visuals are hit-and-miss. The minimalistic sets by Kevin Depinet and the digital scenography by Jakob Bønsdorff Eriksen are pretty. The costume design by the Tony-winning designer Ann Hould-Ward, however, looks cheap and weird and honestly ugly, not quite modern but definitively not period either. The physical production would be all right, though, were it not for the mess of a script and lackluster songs. You cannot mask such fundamental problems, no matter how high your production values are. How I wish this musical would have been worth seeing. The Prince of Egypt is a gorgeous movie. The good thing is that no matter what the musical is like, no one's going to take that away from me, I can still enjoy the film whenever I want to. But I know how eagerly the musical fandom has been looking forward to the musical adaptation, and I think it's a huge shame this is how it turned out to be. I suppose they're still testing the musical out in Denmark and, hopefully, are making changes to it before trying to produce it anywhere else. They have to do a lot, a lot, to make this work, but I wish they'll go to the trouble. 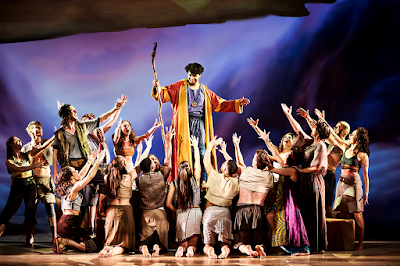 Both the movie and the age-old story of Moses deserve a way better musical adaptation. Also read The San Francisco Chronicle's review of the Californian run of this international production – not much was fixed in between that and the Danish run, it seems like. P.S. About the songs from the original movie: they're still absolutely gorgeous, even if all that remains of Playing with the Big Boys is the intro and The Plagues has been combined with another, inferior tune. The former I could forgive, but the latter... If you've ever heard the song, I'm sure you understand why I cannot. P.P.S. The crossing of the Red Sea was done by splitting the orchestra stalls in two. Sorta impressive. Sorry about this. I know how much you were looking forward to it. Yeah... But somehow, though, I'm still glad I saw this! It was a disappointment, sure – but I had a lovely mini-break in Denmark with my friends nevertheless, and I think I would have been upset to miss the musical even if others had told me it's bad. Now I at least have seen what it's like for myself. One small detail stands out to me, even though it's one of the less offensive ones: "Moses only stops the guard beating the slaves when he starts hitting his sister Miriam too." When the movie first came out, I read that in an early draft of the script, they were going to have Miriam be the beaten victim who Moses defended, but specifically decided against that, because defending a random stranger made Moses more compassionate and heroic. Why on earth would the musical go back to the early draft's idea when the screenwriters specifically changed it to better serve Moses's character? I thoroughly agree, I included that bit with all the other weirdness since the change completely baffled me. 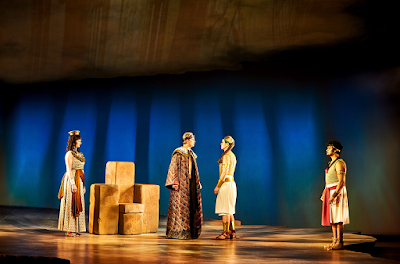 With that and his emphasised mistreatment of Tzipporah, it's almost as if they tried to make young Moses as unpleasant as possible – for what reason, I have no idea.